Genuine Prosciutto di Parma is now available pre-sliced in attractive, convenient vacuum-sealed packs. 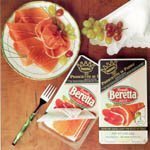 Fratelli Beretta uses a special, non-absorbent paper so that the slices separate easily. This succulent, fruity Prosciutto is produced, sliced, and packaged in Parma, Italy under strict supervision. If our 15 lb. whole leg Prosciutto is too much for you, try one of these on for size! No water or nitrates added. After opening use within three days. If you have any questions about this product by Fratelli Beretta, contact us by completing and submitting the form below. If you are looking for a specif part number, please include it with your message. Argitoni Pecorino Romano Cheese - Quart Wheel, 13 Pound -- 1 each. Saint Agur Cheese Wheel, 5 Pound -- 2 per case.